Crabs are amazing animals. No wonder we love to find them in the Cornish rock pools. They’re also sentient creatures that need to stay cool and wet and to be handled very gently. 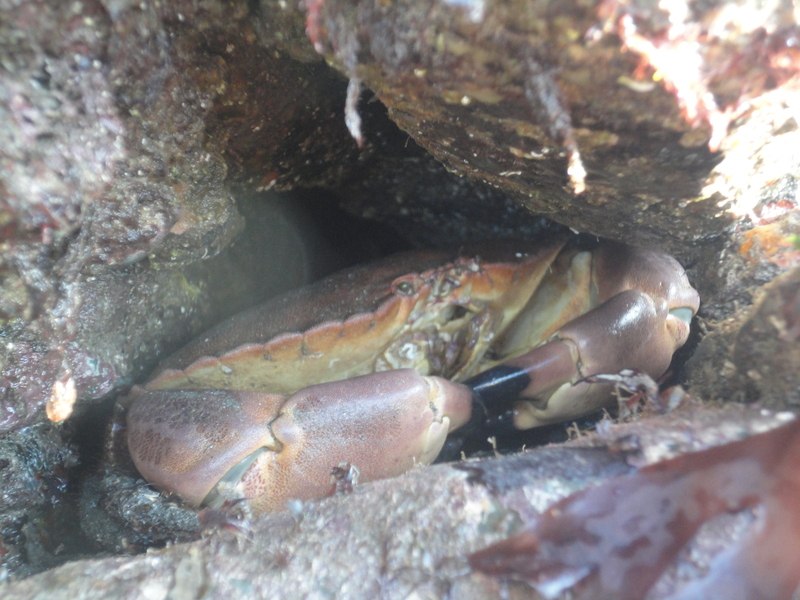 Whether you’re rock pooling or crabbing this summer, here are 5 top tips to keep yourself and the crabs safe and happy. Have fun! If the crab is running around you’ll struggle to get a grip and you’ll both get hurt. Before you try to pick it up, press a finger gently but firmly in the centre of its shell. It then won’t be able to move and you have time to get a good grip. If the crab’s shell feels soft, let it go straight away and don’t try to handle it. It has just moulted its old shell and is very vulnerable until the new one hardens. 2. Lift from under the armpits. This is the only sure way to pick a crab up without getting pinched. Crabs can get injured if you drop them so it’s good for them too if you use this trick. Put your thumb and one finger either side of the crab’s shell, just below the base of the pincer legs. When you have a good grip ‘under the armpits’, you can pick the crab up without being pinched. If you’re picking up a large crab, you’ll need a hand each side. Hold a crab under the armpits of its pincer legs. Green shore crab. 3. A wet crab is a happy crab. A crab needs to stay cool and wet to be healthy. After you have looked at your crab, remember to return it immediately to either a large, full bucket of seawater or to the pool in which you found it. Don’t keep a crab in a bucket for more than a few minutes – the water can heat up quickly. Either change the water or return the crab to the sea. Try to keep to one crab per bucket and return the crab quickly to where you found it. Crabs are generally solitary, territorial creatures and they hate being forced into close quarters with other crabs. If you put crabs together they’ll attack and maybe even eat each other. 5. Now you’re both happy, take a close look. Crabs are pretty cool. Use my guide to identify what species you’ve found. When a crab grows, it steps out of its shell, legs and all and a new shell hardens. Look at the underside of a crab to see if it’s a male or female. You can tell from the shape of the tail. The male has a pointed triangle tail and the female’s tail is a wider, u shape. This is where she keeps her eggs. 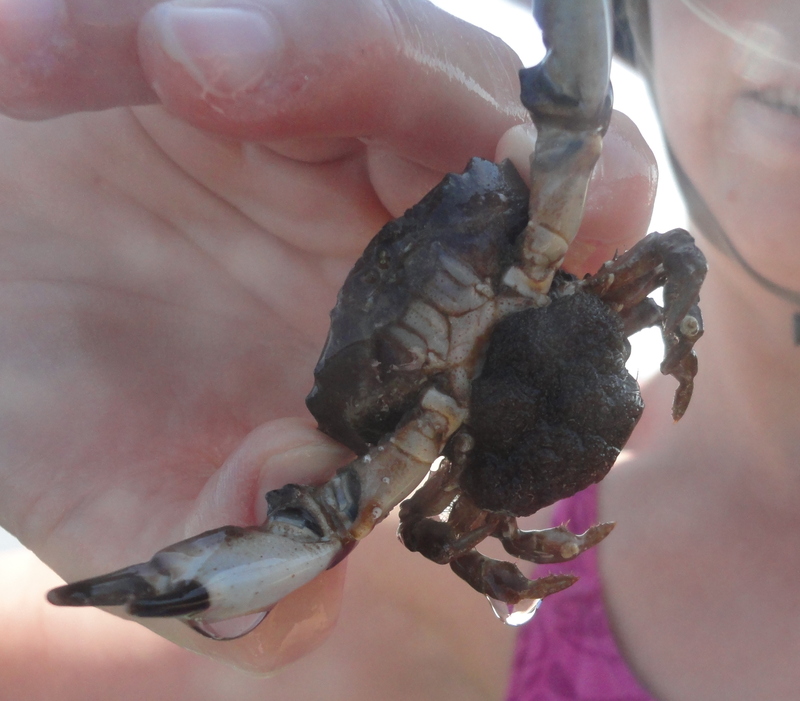 There are lots of different species of crabs, hermit crabs, porcelain crabs and squat lobsters on Cornish beaches. Pick up a shore identification guide and see how many you can find. Baby crabs come in a huge range of colours. Barnacles and crabs are related – they’re both crustaceans. 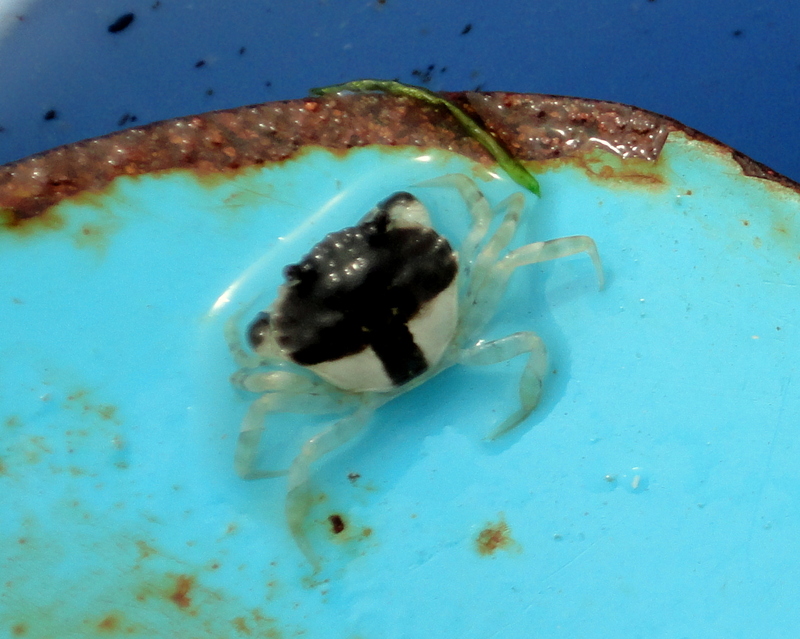 Montagu’s crab with eggs tucked under her tail. If you find a crab with eggs, put her straight back where you found her. 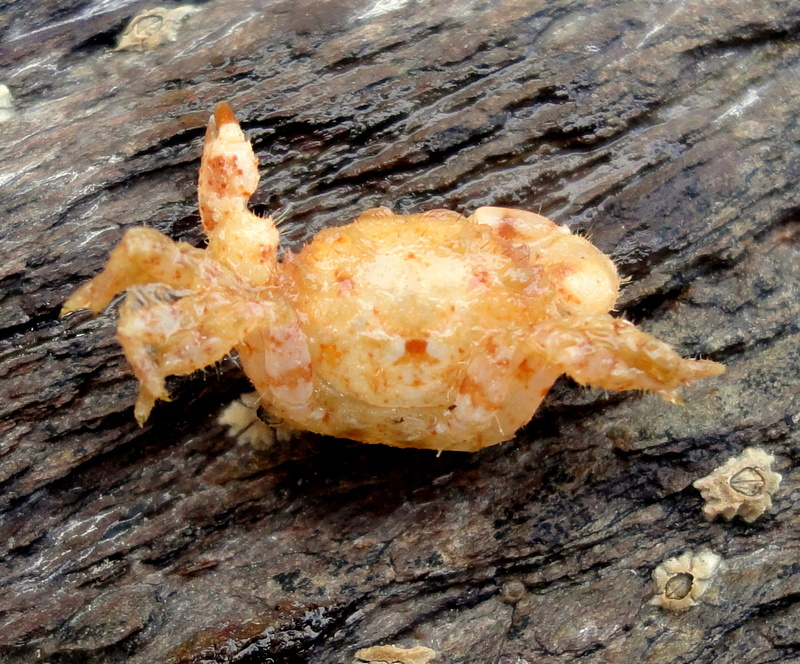 The moult (discarded shell) of a hairy crab. The live crab has grown and stepped out of this shell. If you find anything interesting, please take a photo if possible, contact me and let the Cornwall Wildlife Trust know. Remember to put your crab back exactly where you found it. If you have turned any stones, leave them the right way up. Someone recently asked me how to pick up a crab I said ask someone else to do it for you, so they did they asked me. Point to note lots of crabs curl up and chill if you turn them upside down and totally agree with you on buckets Heather, hate seeing kids mistakenly killing the animals they love. Thanks Mark. I think asking someone else is an excellent plan, both for those who are unsure and might drop and injure the crab … and also for me when some kid brings in a giant Velvet swimming crab during a rockpool ramble and expects me to pick it up from the bottom of a narrow bucket while it’s reared up ready to pinch as soon as I put my hand in. Not sure I’ll get any volunteers though! Yes, some crabs do curl up. Edible crabs are often called ‘dormeurs’ in French (sleepers) because they tuck in and pretend to sleep when you pick them up. Not all crabs know about chilling though… and will go for you no matter what! 😀 I’ll keep trying to convince the rest of the world about the one crab per bucket rule. I hate seeing crabs dying in overcrowded buckets.